Auction bid paddles are imperative to a successful auction. Why? Bid paddles are a great way for guests to bid and have fun. They also double as a fan when the action heats up. Having numbered bid paddles can help with your Open Ask. It’s easy to ask donors to raise their paddles if they are going to support you at a certain level. That way your auctioneer or representative can move the auction right along. Auction Bid Paddles Provide an Emotional Factor. Bidders are more moved when reaching down, grabbing that paddle and holding it up high in the air. Auction Bidder Paddle are FUN! Bid paddles are a great way for guests to bid and have fun. Bidders love the excitement of the live auction. Paddle raises allow them to see who they are bidding against, activating their competitive spirit. Auction Bid Paddles are Practicle. Auction bid paddles double as a fan when the action heats up. Print your event program or your list of auction items on them. 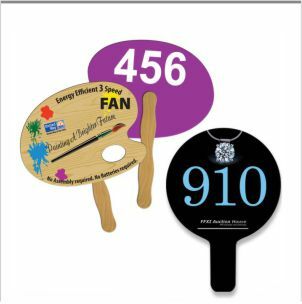 Auction Bid Paddles can provide you with advertising revenue. Sell advertising space on your auction paddles. Auction Bid Paddles Move Things Along. The auctioneer will be able to recognize bid paddles as rapidly as possible, with a steady cadence. If people raise paddles, the auctioneer identifies them by their number - "123, thank you very much" - and can move right along at a steady clip. Bid paddles are a great way for guests to bid and have fun. They also double as a fan when the action heats up. Having numbered bid paddles can help with your Open Ask. It’s easy to ask donors to raise their paddles if they are going to support you at a certain level. That way your auctioneer or representative can call off the numbers to a donations administrator so your supporters’ donations can be added to their summary “invoice” at the end of the evening. But again, what if table mates’ paddles get mixed up and one supporter raises the wrong paddle number to donate? That can make for a nightmare at checkout and might cost you precious donations.